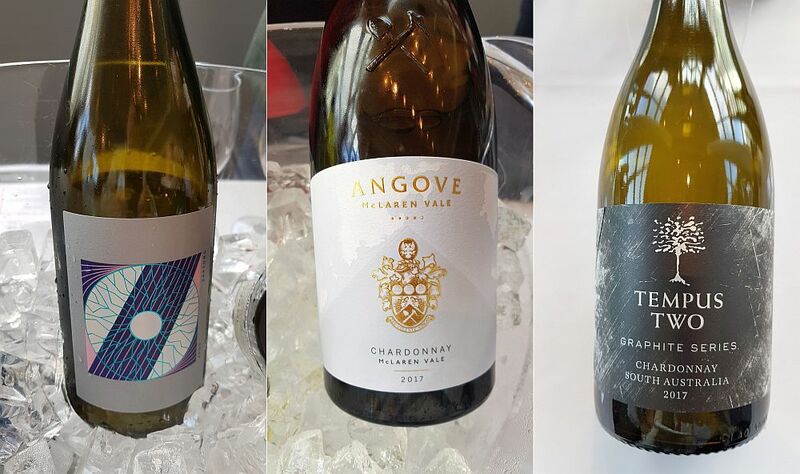 What do you know about the current (2017) statistics about Australian wine? Did you know that the total vineyard area in Australia is 135,133 ha, of which Shiraz accounts for 39,893 ha (30%) and Chardonnay (the largest white variety) cover 21,442 ha (16%)? There are estimated to be 2468 wineries and 6251 grape growers in Australia. Compare that to Canada with 671 wineries from the latest statistics. We have 274 licensed grape wine wineries in British Columbia as of 2017. 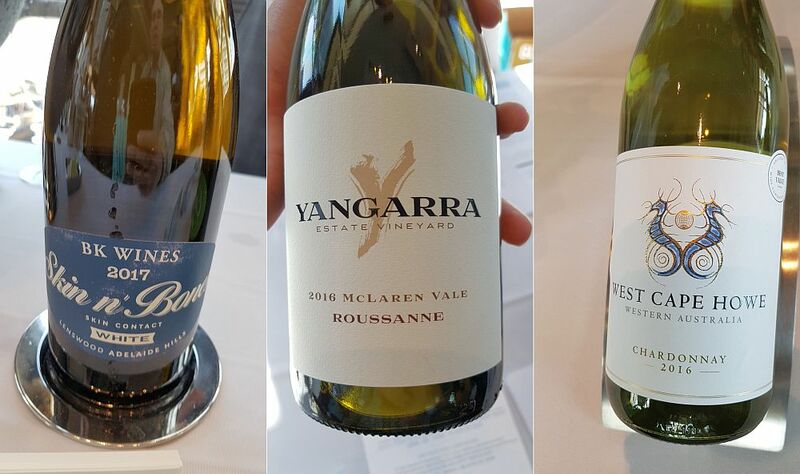 With such a great volume of grapes planted in Australia, there are opportunities to grow not only Shiraz and Chardonnay but also other grapes like Grenache, Cabernet Sauvignon, Savagnin, Glera, Chenin Blanc, Pinot Noir and much more. 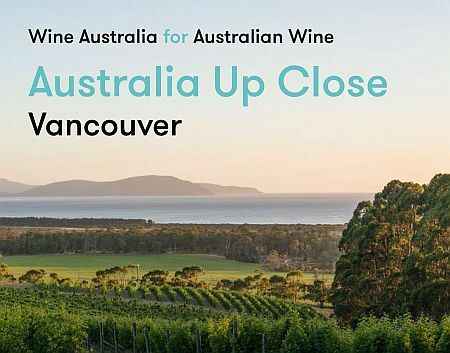 Recently Wine Australia visited Vancouver and brought 165 wines from 31 wineries, covering 17 different wine growing regions to be tasted. Below are 18 wines that I thought were very good. I wasn’t able to taste all 165 wines but tried my hardest for you. Some wines are currently available and others hopefully will soon be available. All wineries do have BC wine agents which is why I think most if not already on shelves in BC Liquor stores, or private wine shops, or will soon be on shelves. Enjoy. Alpha Box & Dice “Zaptung” South Australia Prosecco NV ($20) – Nice floral and lychee aromas. Slightly off-dry, but with high acidity. Flavours of apples, lime and green fruits. Medium bubble with a bit of bite that later turns into creaminess. Tasty. An interesting label that looks like an aggravated eyeball. Maybe too much prosecco? Tempus Two “Graphite Series” South Australian Chardonnay 2017 ($13.10) – An outstanding price. Nice medium minus intensity tropical fruit and butterscotch aromas. Fuller bodied, semi-round with medium plus acidity. Toast and tropical fruit flavours. Good quality. BK Wines “Skin N Bones White” Adelaide Hills Savagnin 2017 ($28.99) – According to Wikipedia “Savagnin or Savagnin blanc is a variety of white wine grape with green-skinned berries. It is mostly grown in the Jura region of France, where it is made into Savagnin wine or the famous vin jaune and vin de paille.” It is also grown in Australia and makes quite an interesting, geeky wine. It has a light intensity nose showing pears and sweet spices. The wine is dry with higher acidity. Pear flavours up front followed by crisp apples later. Give it a try! West Cape Howe Wines “Cape to Cape” South West Australia Chardonnay 2016 ($17.97) – Very aromatic nose with a mix of grapefruit and peach aromas. Medium plus body, round and soft. Nice citrus and stone fruit flavours on the palate. A tasty wine. 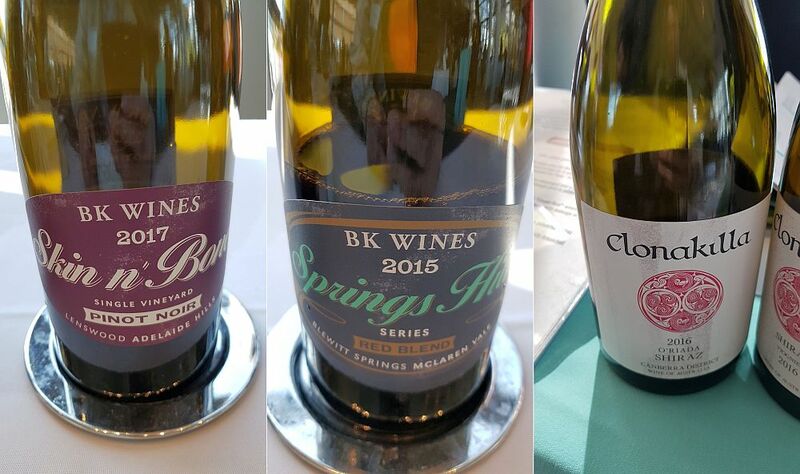 BK Wines Springs Hill Series Red Blend 2015 – Old World oak and red fruit on the nose. Dry with higher acidity. Flavours of raspberries and red fruit, along with Old World oak. A cool wine. Clonakilla “O’riada” Canberra District Shiraz 2006 – Nice light oak and ripe raspberry aromas int he glass. Medium plus body, dry, and roundish mouthfeel. Ripe raspberries and roses, with light tannins and peppery finish. Very good. By Farr “Farrside” Geelong Pinot Noir 2015 – Nice raspberries and red fruit on the nose. Fuller bodied, dry with ripe red fruit and sweet spices on the palate. Lighter mouthfeel with a mineral streak. Henschke “Henry’s Seven” Barossa Valley Barossa Shiraz Grenache Viognier 2016 ($42.89) – Medium intensity raspberry aroma in the glass with more on the plate. Slightly off-dry, medium minus body, medium acidity, and light fine tannins. 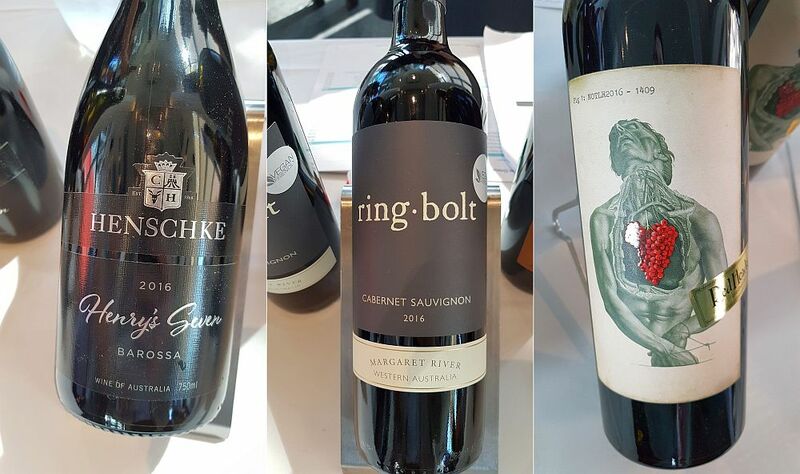 Ringbolt Margaret River Cabernet Sauvignon 2016 ($19.35) – Capsicum and red fruit on the nose. Medium plus body and tannins. Red cherries and other red fruit flavours, finishing with some sweet spices. Dry with a lighter mouthfeel. Elegant. Red Heads Wine “Night of the Living Red” Australian Barossa Durif Cabernet Touriga 2016 ($36.99) – An interesting wine in part as it uses Durif and Touriga. Durif is Petite Sirah, while Touriga is Touriga Nacional, a Portuguese grape. Nice aromas of raspberries and cassis, with more on the palate. Dry and round, with medium tannins. Silky mouthfeel. Some nutmeg and other sweet spices. Good acidity. Soumah “Hexham” Yarra Valley Pinot Noir 2016 – Bright red fruit, roses and sweet spice aromas. Medium minus body, dry with higher acidity. Red fruit, raspberries and floral flavours followed by sweet spices. Nice and light and bright. 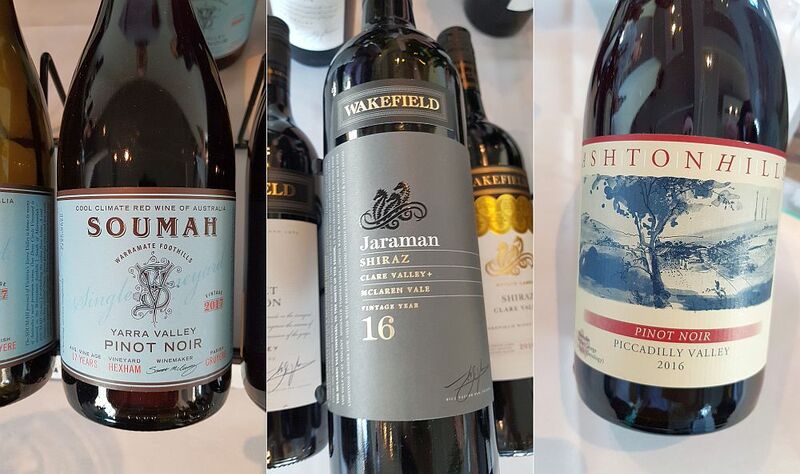 Wakefield “Jaraman” Clare Valley McLaren Vale Shiraz 2016 ($26.28) – Jaraman FYI means seahorse in the Australian Aboriginal language. There is a drawing of 3 seahorses on the label. This wine has a light vanilla, cedar, ripe red and black fruit nose. Medium plus body, round and dry, and silky on the palate. Quite fruity, with red fruit flavours, vanilla and sweet spices. Easy to enjoy. Wirra Wirra “Ashton Hills” Adelaide Hills Piccadilly Valley Pinot Noir 2016 ($29.97) – Nice light aromas of tea leaves, red fruit and roses. These aromas continue to the palate. Dry, light body with higher acidity. Light intensity tannins. A pretty wine. Wolf Blass “Gold Label” Barossa Shiraz ($20.49) – Juicy cassis nose. Medium plus body, round with a heavier mouthfeel. Smooth. Flavours of dark fruits and cassis, with fine tannins. Easy to drink. 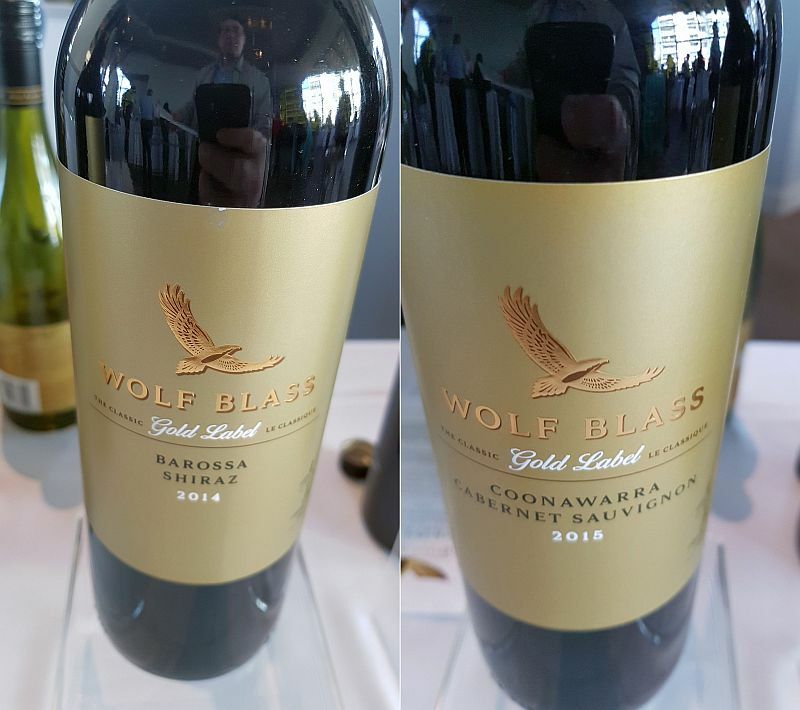 Wolf Blass “Gold Label” Coonawarra Cabernet Sauvignon ($20.48) – Nice light cassis and dark fruit aromas. Fuller bodied, medium plus acidity and medium minus tannins. Mineral, raspberry and red fruit flavours, with some pepperiness on the finish. Really nice mate.